Daily Resort Charge will be added to the room rate and includes Guest internet access/ domestic long distance calls 30 min max per day DVD NOW with unlimited movies 2 complimentary cups of Starbucks Coffee OR 2 16 oz. bottles of water per day 1-800/local calls. 100 PCT NON SMOKING. 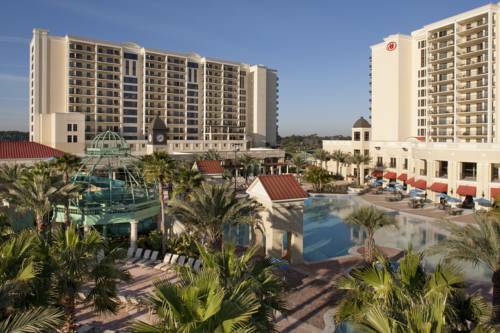 Parc Soleil Suites by Hilton Grand Vacations is located on 52 acres off Palm Parkway in Orlando Parc Soleil Suites is in close to Walt Disney World Universal Orlando SeaWorld Orlando Aquatica and is convenient to I-4 and more than 94 championship golf courses. Complimentary fitness center fully-equipped with Precor equipment and path around the lake. Guests of Parc Soleil Suites enjoy studios one and two-bedroom suites. The suites offer separate living and dining areas a fully-equipped kitchen washer and dryer and granite countertops throughout. Parc Soleil Suites by Hilton Grand Vacations Amenities and Services * 52 acres of flourishing landscaping including a walking/jogging path * 24-hour security gate entry for registered guests * Large swimming pools whirlpool spas and a water slide * Tennis courts playground and supervised recreation programs for all ages * Complimentary Fitness Center featuring Precor equipment * Outdoor grills available * Complimentary on-site parking * On-site laundry facilities available * Poolside bar and grill Cafe Soleil deli and mini market * Accessible rooms and facilities Daily Resort Charge will be added to the room rate and includes Guest internet access. domestic long distance calls /30 min max per day/. DVD NOW with unlimited movies. 2 complimentary cups of Starbucks Coffee OR 2 16 oz. bottles of water per day. 1-800/local calls. RESERVATIONS MUST BE CANCELED *72 HOURS* PRIOR TO ARRIVAL DATE TO AVOID A PENALTY OF ONE NIGHT ROOM AND TAX CHARGE. *NOTE-INDIVIDUAL PLANS MAY HAVE VARYING CANCELLATION POLICIES. Open for breakfast lunch and dinner the poolside Cafe Soleil restaurant features a casual atmosphere and eclectic cuisine.